If you know the story thus far—like, you saw the "ex-lawyer" ad and want to know what happened with it—just skip to the next section. If you’re just joining us, here’s what you need to know: we’re a compliance design (and increasingly, tech) startup. 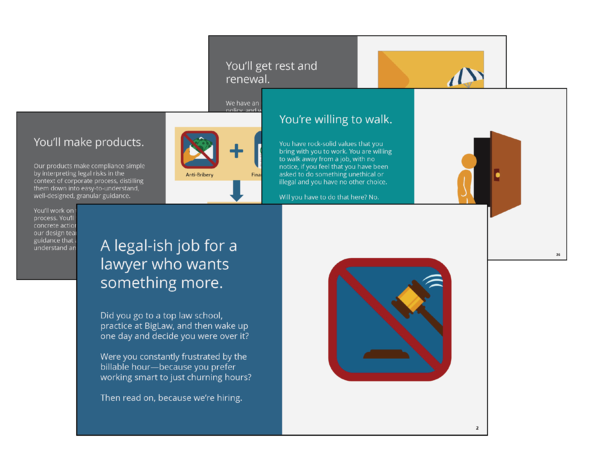 Our niche is converting legal and ethical standards into things people actually need to do at work; or, if you want to be snarky about it, we translate between compliance lawyers (like me) and human beings (like everyone else) using design and tech. For the first couple years I did the majority of our copywriting myself. 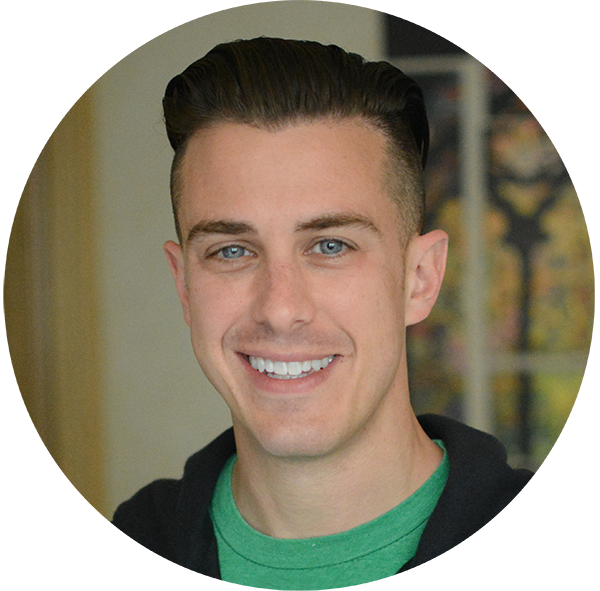 That became an increasingly obvious problem as we grew; we knew we needed to hire someone to take on a lot of that work as my responsibilities changed because I was bottlenecking our designers. That led to this job opening. Historically, we’ve hunted down employees. For example, here’s how our design team was built: I found Ryan’s website; he found Rachel’s website; she found Xinia’s website; and then we hired them away from their jobs. And I found Courtney, our other ex-in-house compliance professional, by digging around on LinkedIn. So, that’s what we thought we’d have to do here. But because we knew this job doesn’t exist anywhere else and it was critical to get the right person on the first try, we decided that we needed to write up a job description for it. Here’s an archived version of the JD; it’s a slide deck. Put simply, we spend enough time wading through the behavioral research to know how easy it is to deceive yourself and justify unethical behavior. 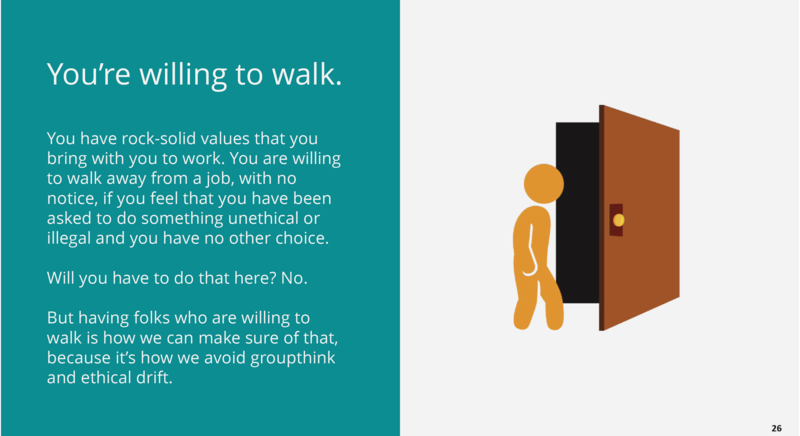 So if you want to work here you have to be willing to walk away from working here; without that, it's just too easy to get sucked into moving the goalposts on your personal ethics, and then that turns into organizational drift. Ultimately, though, the JD was written to act as a filter. 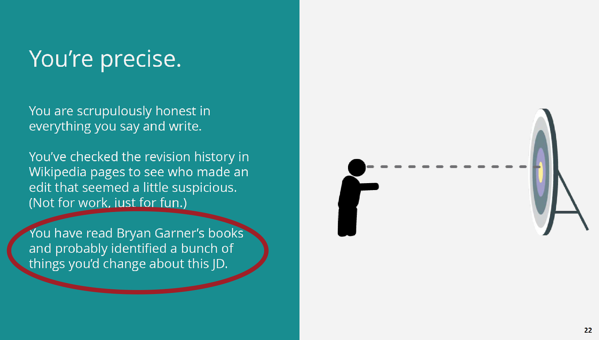 If an illustrated job description with a Bryan Garner joke in it wasn't your thing, this wasn’t the right gig. We initially sent the JD to a couple of our customers and friends and didn’t get much back. So, we were prepared that it might be a slog, and decided to put it on LinkedIn and Indeed to see what happened. And yikes: a lot happened. 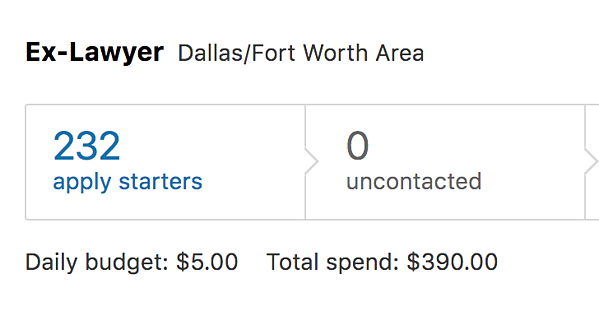 To give you a sense of what went down, LinkedIn estimated that we’d have to spend $360 to generate 10 applicants. We actually spent $390 and got 232 applicants. So yeah, the job was around 2,000% more popular than estimated. That was just LinkedIn. And fortunately, not all of those turned into people emailing us—which is what we asked people to do—because I think I would have had a panic attack. We had been expecting to get some junior associates at BigLaw firms applying, and maybe a handful of in-house people. And yeah, we had applications from junior associates and junior/mid-level in-house people—but also general counsels. And regulators. We received so many applicants that we ended up only focusing on people who were already in Dallas, but we had people reach out from as far away as Europe and Asia and Africa. It was absolutely overwhelming; we had probably 10 people in Dallas alone who could have done the job we initially scoped—we ended up upgrading the position for the person we actually hired—and I'm hopeful we can bring on more of them soon. 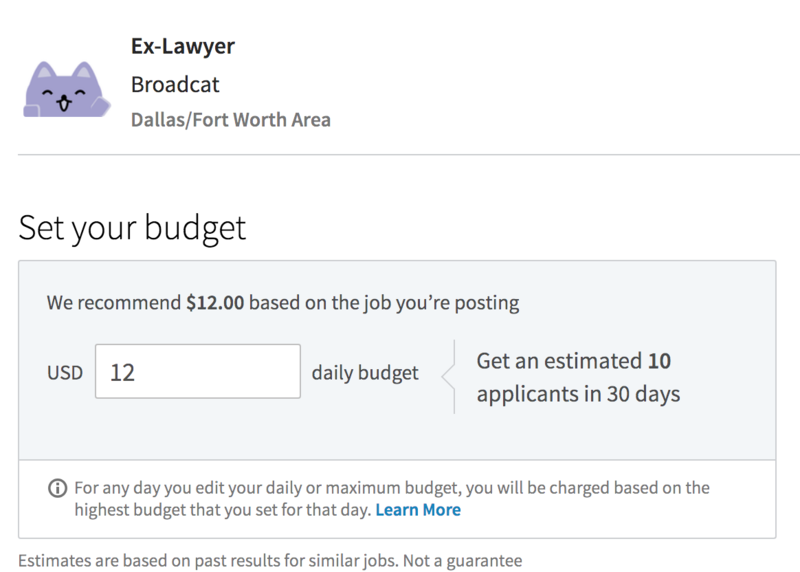 So, pro tip: if you’re thinking “it’d be helpful to have someone with a legal background for a fairly non-traditional job,” the title “ex-lawyer” is a big draw. There are great people out there who are sharp and analytical and want to do something different, and it's worth putting in the time to craft a more creative job posting. Early-stage company hiring process is mayhem. Anyway, you get it: a lot of people applied. 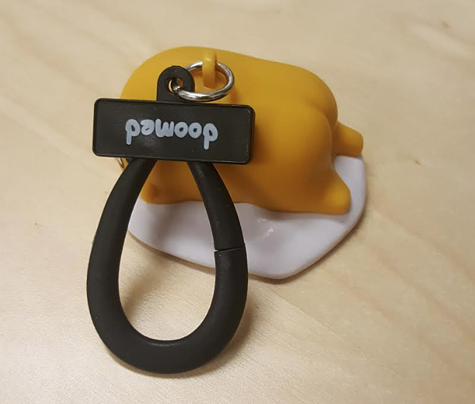 But as an early-stage startup, our HR manager is basically this Gudetama keychain I got at Target. Now, my past experience, coming from a big-company background, was that when you want to hire someone you just tell HR and then around 10 resumes that are a reasonably good fit will magically appear. As it turns out, uh, there are a couple steps in the middle there. My initial plan was that I would respond to every applicant personally. I’ve been on the other side of the table more than enough times to know how much it stinks to not get acknowledged. But I also had no idea how many people would apply, so that idea got abandoned pretty quickly. I did try to respond if it was a really creative application, even if it wasn't likely to be a fit, but I know I missed folks. For example, let me directly address the guy who used the word “meow” like 100 times in his cover letter: that was awesome and I hope you get the job of your dreams because you are a national treasure. I also really respected people who applied and were like “I don’t meet X credential you want, but I think you should look at me anyway and here's why.” That takes a ton of courage and vulnerability, and it also reflects the understanding that credentials are just proxies anyway. And I also hope that you are open to considering that the right fit might be starting your own company or consultancy—that is, it's possible that you weren't really being drawn to us because of who we are or what we do, but because you have a desire to create your own thing (even if you don't recognize it yet). 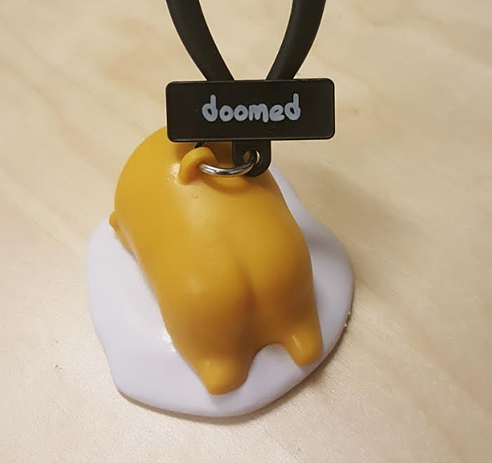 Personally, I got rejected for in-house jobs at Google, Facebook, Amazon, Coinbase, Lendup, Riot Games, Loot Crate, Dollar Shave Club, and many, many more before I had the idea to start Broadcat. I wanted to work at some of those places so badly that it hurt to never hear back because the jobs sounded perfect. But I’m glad, because I think I would have had a low-level degree of anxiety and ennui if it'd worked out—not because there's anything wrong with those companies, but because I realize now I was being attracted to creative workplaces by a desire to create something, and I could only satisfy it by actually doing that. So for what it's worth, if you figure out that's what's really driving you, too: it's scary, but it's worth it. We hired Nancy from Pei Wei, where she was the General Counsel; she has past experience as in-house counsel, outside counsel, and government (as a trial lawyer at the Department of Labor), as well as business-side experience with being part owner of a tech company. She’s lived overseas, has a signed copy of a Bryan Garner book, and is already well-loved by Mrs. Pickles, our office dog, who is hopeful that Nancy will be the weak link who gives her people food. 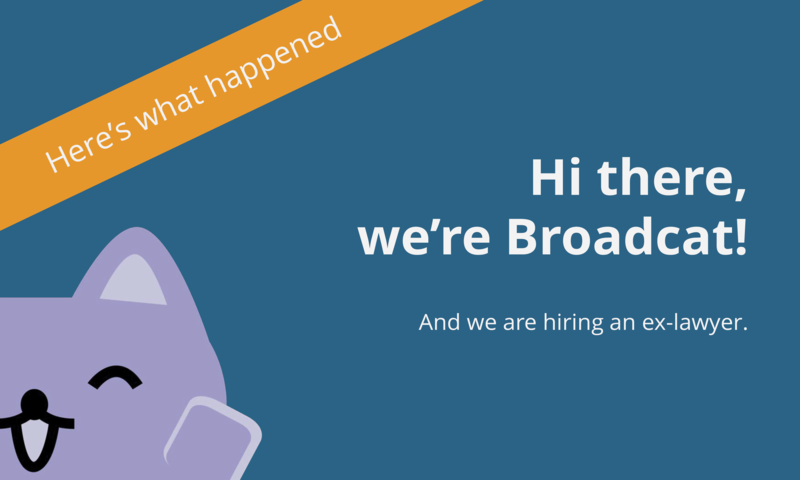 At Broadcat, Nancy’s role is VP Product and GC; we ended up building a bigger role than we planned once we met her, which also reflected that our business morphed a little from the time we wrote the JD to when we made the hiring decision—the business-side stuff, commercial legal, and dealing-with-backers experience became more helpful and critical than we thought when we started the process. And that’s another thing about being on this side of the table: even when you think you know what you need, it can change while you’re in the process. She’ll be with us in Vegas at the SCCE conference this year, and if you’re a client you’ve already started hearing her on calls as she takes over more of the content role from me. Say hi!